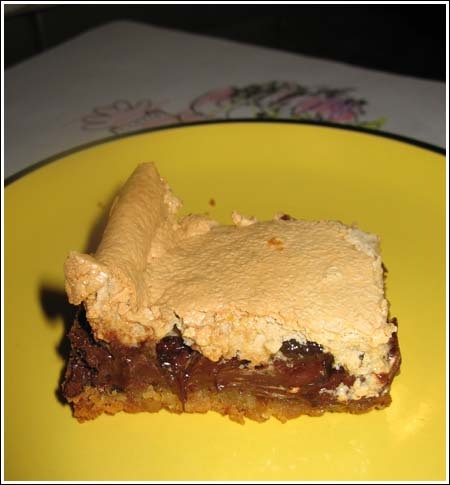 Back in 2005, I made Vienna Squares, which are bar cookies composed of shortbread, raspberry preserves and meringue. After I posted Vienna Squares, I received some emails asking if I’d ever tried the chocolate chip version. I hadn’t at the time, but eventually I did. Yesterday, a Cookie Madness reader emailed me another recipe for a meringue topped bar cookie – a nut-free version with slightly different proportions. This version was much better than the last. Or maybe I was just hungrier. It’s hard to say, but I prefer this recipe. What I also liked was the concise format showing the Name, Course, Category etc. — Difficulty is “1” , Rating is “5” and cook time is only 25 minutes. I liked that format so much that I inserted my own note so when you pass this recipe down to your children, they’ll know they can bake it in an 8 inch pan. Note: I baked a half batch in an 8 inch pan. Combine the next three ingredients (flour, soda, salt); gradually add to creamed mixture. 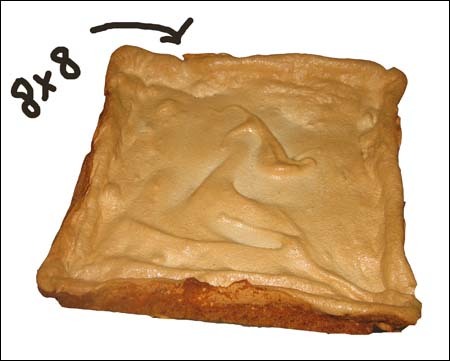 Spread into a greased 13×9 inch metal baking pan. Sprinkle with chips and pat lightly. golden brown. Cool on a wire rack. Cut into bars. Store in the refrigerator. 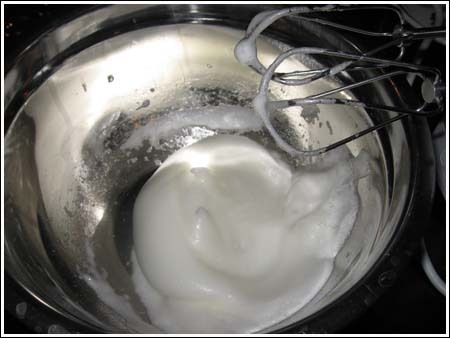 Cookie Madness Tip: Egg whites whip up faster in a metal bowl. I just added a line to clarify. The recipe is the original. My changes were to use an 8 inch pan, halve the base and do 2/3 of the topping. I did 2/3 of the topping rather than 1/2 because I didn’t want to deal with halving an egg white and it seemed a little extra meringue might be a good thing! Anna Are the ingredients for the original recipe or do they reflect your madifications?